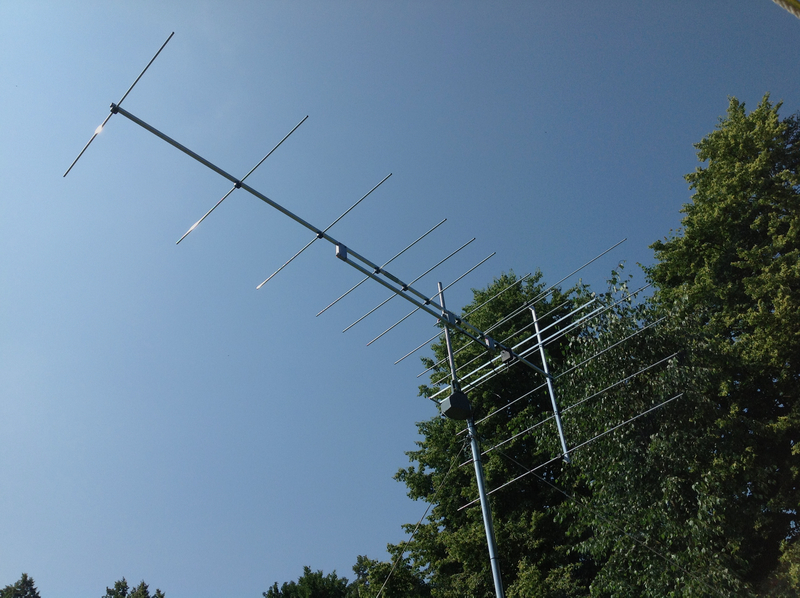 Peter Körner in Lund, Sweden, designed this Yagi array. 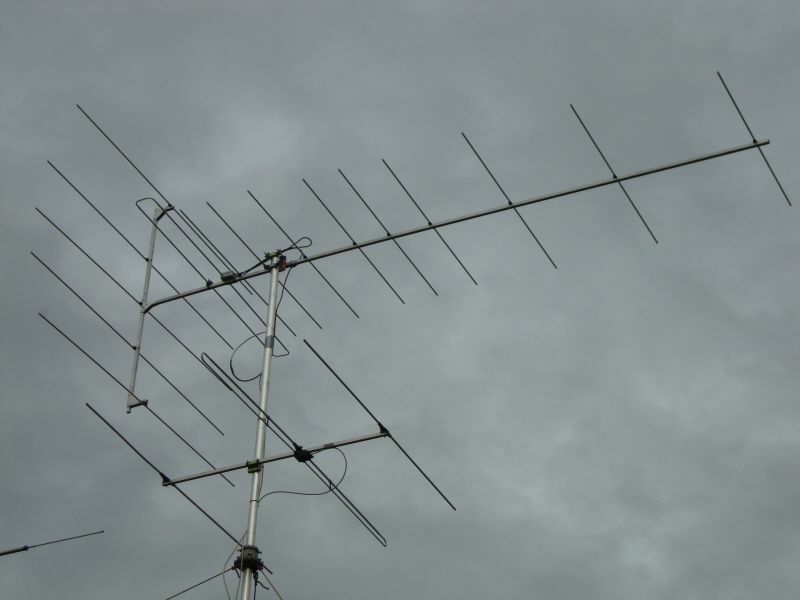 It has a boom length of 3.73 m (147″), 15 elements, five reflectors, a horizontal folded dipole, and uses a halfwave coaxial balun. Unlike log-Yagis, the 15.12 has no phasing lines that can induce current in the boom and degrade the pattern. 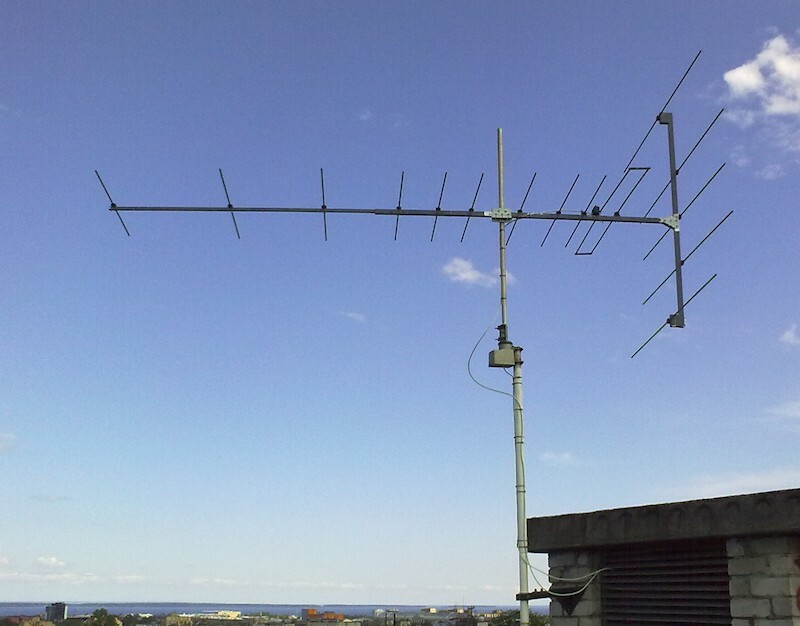 This overhead view shows the horizontal folded dipole. It is unusually long and the two conductor currents differ, as does their coupling to the first director. Because of these factors, conductor spacing strongly affects antenna performance and can be optimized. It provides only a weak degree of freedom for a vertical folded dipole. 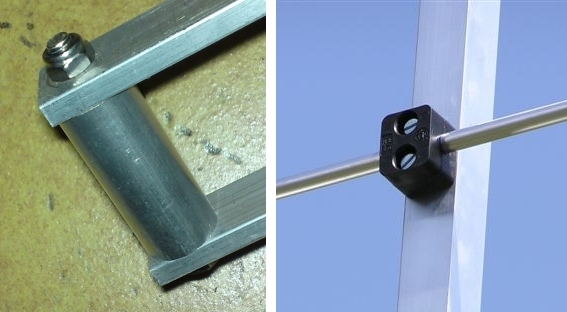 This shows how the 15 mm × 5 mm folded dipole conductors join at the ends. The element mount on the right is a repurposed support for 10 mm hydraulic fluid lines. I modeled the antenna with the AO 9.57 Antenna Optimizer program using 28 analysis segments per conductor halfwave. Forward gain includes mismatch and conductor losses. F/R is the ratio of forward power to that of the worst backlobe in the rear half-plane. This shows how ground proximity affects F/R at 1° elevation angle for various antenna heights. The 11.48 mm diameters are cylindrical equivalents of the 15 mm × 5 mm rectangular folded dipole conductors. The 15 mm conductors are short tubes that connect the folded dipole ends. The following table shows the largest performance degradation over 88, 93, 98, 103, and 108 MHz in dB when altering a symbol value by Tol. This is Georgiy Markiev's 15.12 in Petrozavodsk, Russia. It rotates here. Petr Vozár erected this 15.12 near Javornik, Czech Republic. Johan Meezen built this 15.12 in Drieborg, Netherlands. The OIRT Yagi below will degrade its performance. 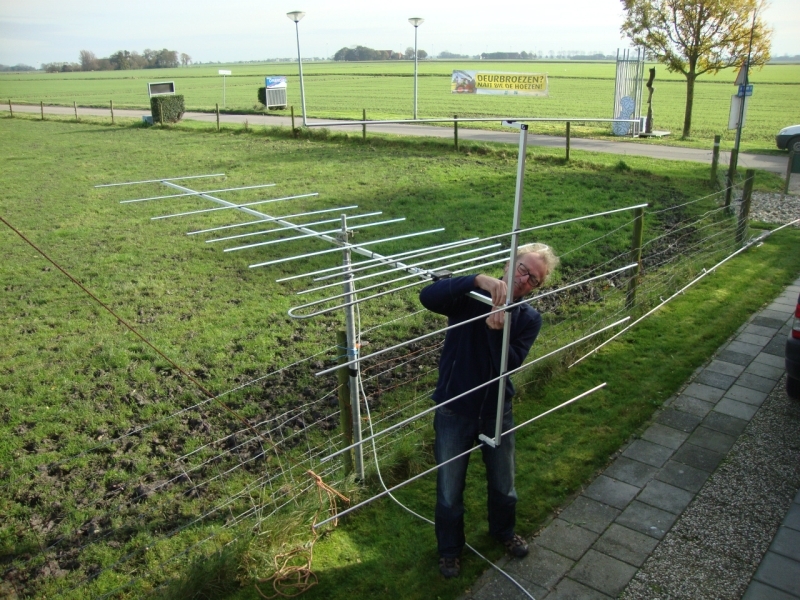 Gerard Noordhof of Gronigen, Netherlands, assembles a portable 15.12 that will be mounted 9 m above ground. Performance drops greatly when the feedpoint is at the rear driven-element conductor as shown. 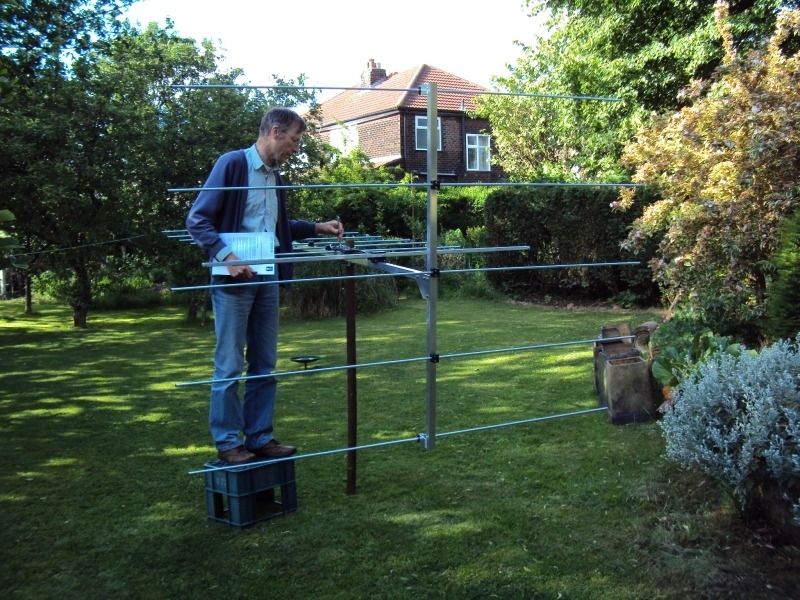 Julian Hardstone of Stockport, Greater Manchester, England, plans to use this 15.12 for DXpeditions.